You can save time and money if you know all the options for buying tickets to the Château and gardens of Versailles. The good news: admission to the gardens of the château is free most weekdays unless there is a special event. The bad news: ticket lines and security lines can be long at Versailles. For train tickets from Paris to Versailles, click here. Or you can visit on a guided tour. The most comprehensive ticket, Le Passeport, is an all-inclusive admission ticket that will admit you to the Château, the Grand Trianon and the Petit Trianon, and Marie-Antoinette's hameau, or hamlet. It also provides access to the gardens and to the Grandes Eaux Musicales fountain program (in season), as well as to special exhibitions. 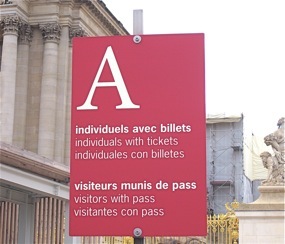 The Paris City Pass does not incude admission to the château, but it does get you a 20% discount on admission to the château, and the same discount on Versailles by Bus and Versailles by Train programs. 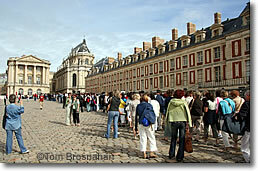 The Paris Museum Pass includes Versailles in its many offerings. You can buy a pass for two, four, or six days. Since a visit to Versailles will require the better part of a day, you will need to decide if you want to use one day of your Paris Museum Pass for Versailles, or if you'd rather save it for a day in Paris when you can visit several museums. Here are tips on Getting Around once you are in the vast palace and gardens complex. With a ticket purchased in advance, you can skip the ticket line and go directly to Entrance A, the main entrance to the Palace. However, you will still have to pass through the security check. Versailles is very popular with visitors, particularly on nice summer days, when you may encounter large crowds passing through security. Arriving early in the morning or late in the afternoon will minimize your wait. the Château de Versailles, France. With your ticket bought in advance, skip the ticket line and go directly to Entrance A, for ticket holders.